Did you know that North Carolina produces 60% of all of the sweet potatoes grown in the US? 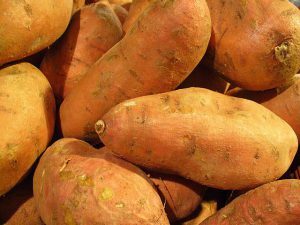 This year that number could be down quite a bit due to the rainfall from Hurricane Florence, which hit at the worst possible time for sweet potato producers. According to this article in Modern Farmer, producers were holding back on harvest because of dry conditions earlier this year, hoping for a little extra moisture to fill out their tubers. But all of the rain from Florence saturated the soils, something the sweet potatoes do not like. Farmers are now waiting to see if the sweet potatoes that are still underground can survive the sodden conditions or if they will rot in the fields. While no one is sure of the exact losses, some people are estimating losses of 25-35 percent. Prices of sweet potatoes went up $2 per carton because of worries about losses in yield. Read more at http://modernfarmer.com/2018/09/north-carolina-produces-60-of-the-countrys-sweet-potatoes-the-crop-is-in-trouble/.